Thanks to the 80’s horror flick, Return of the Living Dead, we know that Zombies like to feast on human brains. Well guess what? I like to feast on jelly shots. So what better way to booze up your Halloween get-together than with some zombie snacks for your undead party goers? These brain jelly shots are perfect for eerie entertaining. They are ghoulishly good. Demonically delicious. Creepily... well, you get the idea. They also take the term "jelly shot" to a whole new level with a slimy surprise in the middle. Trick or Treat? How about both! To get the walking dead recipe, head over to Tablespoon. 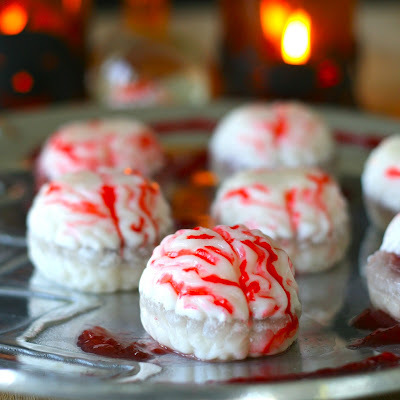 And for even more Halloween fun, don't forget to check out the Zombie Jelly Shots from last Halloween! "Well guess what? I like to feast on jelly shots." ... This might be the best blog post ever. I'm in.